Looking for a team experience that will encourage everyone in the group to both communicate and have a great time? Then look no further than WhirlyDome. Equipped with a full bar and restaurant, plus one of Orlando’s favorite entertainment options, WhirlyBall, the team will have a blast. WhirlyDome is great for team building events, employee appreciation and general team outings. Why host a basic happy hour when you can host a fun team WhirlyBall outing instead? Have a date and time in mind? Fill out our reservation request form below and one of our expert meeting planners will help get the ball rolling. Otherwise, if you just have a few general questions, please see our group FAQ below or e-mail us at info@whirlydome.com – we’re here to help! Take your birthday parties, corporate events and other get-togethers to the next level with WhirlyBall. Please see our event planning pages for more information about events at WhirlyDome, event packages, group rates, and more. 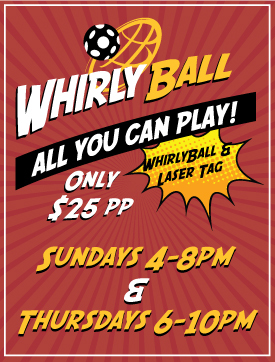 info@whirlydome.com For other whirlyball locations, click here. © Copyright 2015 WhirlyDome. All rights reserved.